There was another big departure in utilitarianism: the will written by its most famous name. The philosopher Jeremy Bentham was born on 15th February 1748 and died on 6th June 1832. That’s a hundred-and-eight-four years ago, but Bentham is still receiving visitors. Anyone who wants to say “Happy Birthday!” or “Happy Death-Day!” to him can easily to do so. Just go along to University College London (UCL), where you’ll find him sitting in a big wooden cabinet on a busy corridor. That’s exactly the way he wanted it: in his will, he requested that his body be preserved after death and put on public display as an “Auto-Icon”. That was the word he invented to describe the idea of a dead person serving as his own memorial. When he passed away, his friends and supporters were happy to meet his wishes. His skeleton was easy enough: when the flesh had rotted from his bones, they were ready to be dressed in clothes. His head proved more of a problem. He had wanted that fully preserved, to keep his real face on display. His friend Thomas Wayward Smith cut Bentham’s head off and used an air-pump to mummify it, drawing off all liquid so that it didn’t rot. The result, as you might imagine, was gruesome: a skull covered with shrivelled flesh. His friends decided to use a wax head for the Auto-Icon instead, with Bentham’s real hair on it. They attached the wax head to the top of Bentham’s clothed skeleton, then put everything inside a big wooden cabinet. His real head – the gruesome shrivelled skull – was placed between his feet. 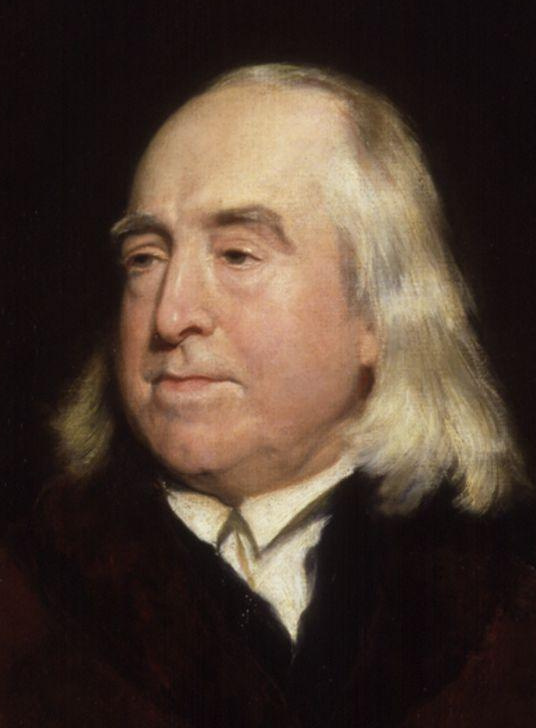 They had met the wishes of Bentham’s will: he was an Auto-Icon, a solid, three-dimensional memorial to himself. Bentham had got ahead of the crowd, because his Auto-Icon was something new and quickly became famous. That was shortly after the founding of UCL, and when the university became bigger, Bentham’s Auto-Icon was moved there. His ideas had been a big inspiration for UCL and the many manuscripts he wrote during his lifetime are still being studied and edited there. But his real head continued to cause problems. Students from rival universities kept stealing it and holding it to ransom, so in the end it was removed from the case and locked away elsewhere. It’s said that the head sometimes attends meetings of UCL’s governing board and that Bentham is listed in the minutes as “Present – Not Voting”. It’s a funny story, but UCL say that it isn’t true. All the same, it would have pleased Bentham. He spent his life trying to make the world a happier place, one where people didn’t fear death or have superstitions about dead bodies. His Auto-Icon has been carrying on his philosophy: it makes people smile and laugh, and it inspires entertaining stories. That’s just the way Bentham would have wanted it.